An annual meteor shower peaks this weekend, but skywatchers shouldn't expect too much, experts say. The Delta Aquarid shower should reach its zenith overnight from Saturday to Sunday (July 28 and 29). Unfortunately, many streaking meteors will likely be drowned out by the bright glare of the moon, which will be nearly full at the time. The Delta Aquarids should be underwhelming this year, "as the peak will be only 4 days from the August 2 full moon," Bill Cooke, head of NASA's Meteoroid Environment Office at Marshall Space Flight Center in Huntsville, Ala., told SPACE.com via email. That's not to say there'll be nothing at all to see. The moon will set after midnight local time around the globe this weekend, so stargazers who stay up late could be rewarded for their efforts. The Delta Aquarids are expected to generate a peak meteor rate of about 16 per hour in a dark sky, Cooke said. The shower is visible from around the world, but observers in the Southern Hemisphere tend to get a better show. That's because the Delta Aquarids seem to radiate from the southern part of the sky — specifically, a region near the star Delta Aquarius (in the constellation Aquarius), which is how the shower got its name. Meteor showers like the Delta Aquarids result when Earth barrels through streams of debris shed by comets on their path around the sun. These icy particles burn up in the atmosphere, leaving brief, bright streaks in the sky to commemorate their passing. Scientists aren't quite sure which comet gives rise to the Delta Aquarids, but they suspect that it may be 96P/Machholz, a comet discovered in 1986 by amateur astronomer Don Machholz. Skywatchers who don't feel like burning the midnight oil this weekend need not despair, for another meteor shower is just around the corner. 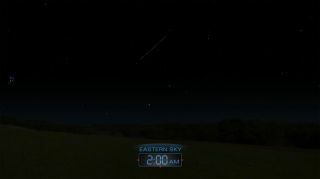 The Perseids, considered by many observers to be the best annual shower out there, are expected to generate 80 meteors per hour when they peak on the night of Aug. 11, Cooke said. If you take any great pictures of the Delta Aquarids this weekend and would like them to be considered for a SPACE.com story or gallery, please send them to managing editor Tariq Malik at tmalik@space.com.